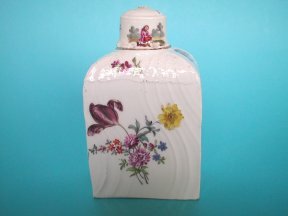 A mid 18th.Century German porcelain tea canister, probably made at Meissen or possibly the Berlin factory. The spirally moulded body with basket weave moulding to the shoulders. decorated with Deutsche Blumen. The cover with a small painted figure in a landscape. Unmarked except for an old collectors mark to the base, which reads, 'Fine old Dresden No.1. The canister is in good condition with just a couple of tiny chips to the edge of the base. The cover which is almost certainly 'married' has several chips to the rim and the finial is lacking. A Meissen Style Dish. Volkstedt. 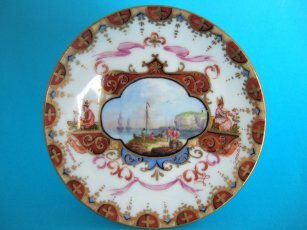 A very well decorated Volkstedt porcelain dish from the late 18th. Century. Decorated in the style of Baroque Meissen porcelain with a reserve of a harbour scene, flanked by chinoisorie figures and scrollwork. measures 11cm. diameter. Marked in underglaze blue with Volkstedt's crossed hayforks mark. A Berlin Cup & Saucer. 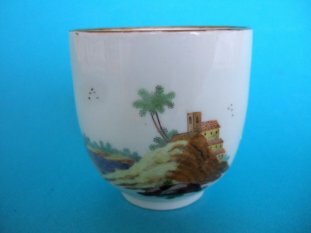 A pretty Berlin porcelain cup and saucer of small size. Made in 18th. Century style but dating from the late 19th. or early 20th. Century. 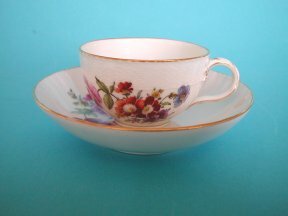 Both cup and saucer have spiral and basketweave moulding and are exquisitely painted with summer flowers. Marked with underglaze blue scepter mark and printed KPM and globe. Saucer measures 11cm. Cup is 6.3cm. at the rim and stands 3.9cm. high. Good, no damage or repairs. Very little wear to the decoration. An interesting German porcelain coffee cup. Decorated with an unusual landscape scene. Factory unknown. It has no marks. Measures 6.5cm. (2,55 inches) high and 6.7cm. diameter at the rim. A long hairline from the rim and some wear.